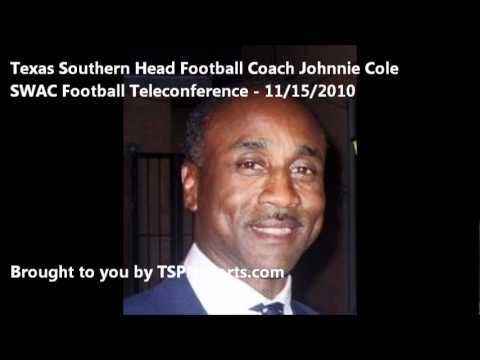 Coming off what is arguably one of the biggest wins in school history, Texas Southern head football coach Johnnie Cole spoke with media members during the SWAC’s football teleconference on Monday. Because of the team’s 41-34 overtime win last Thursday over Grambling, TSU has put itself in a position to clinch the SWAC West division title and a berth to the SCG with a win over Arkansas-Pine Bluff this Saturday. More notably is hearing Cole talk about a previous comment made by Grambling Coach Rod Broadway that as Cole put it, “stuck in my craw” when Broadway described what it would take for Grambling to defeat Texas Southern.